In July 2014, the foreign ministers of France, Germany and Italy condemned the “anti-Semitic rhetoric and hostility towards Jews [and] attacks on people of the Jewish faith and synagogues” that were taking place in their countries and elsewhere in Europe. Recognizing the ominous nature of these occurrences, they pledged to do “everything we can to ensure that our citizens can continue to live in peace and security, free from anti-Semitic hostility.” Unfortunately, such noble declarations made no impression on Islamist terrorists and in 2015, four Jews were murdered in a kosher supermarket in Paris and a Jewish guard in Copenhagen. Today we find in mainstream society “anti-Zionist” vilification and anti-Jewish censure. Bernard-Henry Lévy identified three sources of today’s antisemitism: anti-Zionism, Holocaust denial, and competitive victimhood. This important volume (537 pages), devised in four parts contains 18 papers by internationally prominent scholars. Its cross-disciplinary approach provides perspective on a frightening development. Part I: Defining and Assessing Antisemitism; Part III: Holocaust Denial, Evasion, Minimization; Part IV: Regional Manifestations. Kenneth L. Markus on the “Ideology of the New Antisemitism”: When we view antisemitism as an ideology, we are able to analyze one of its most distinctive features, namely, the irrational willingness of highly educated and intelligent persons to strongly defend so many false, groundless und completely implausible beliefs about Jews… We rely on education and forget, that “concentrated on disseminating correct information and … disproving the accusations of the intolerant” fail to address the psychological roots of prejudice. 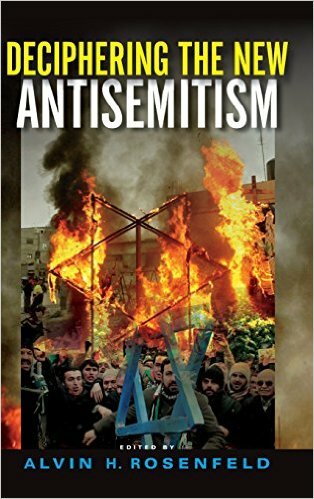 Günther Jikeli gives “A Framework for Assessing Antisemitism, Three Case Studies (Dieudonné, Erdogan and Hamas) His evaluation leads those fighting antisemitism to practical conclusions. Elhanan Yakira looks at two persons who occupy the “high moral ground”: Blaise Pascal and Ernest Renan. Both were good men, yet their respective discourses on the Jews were bad. Doron Ben-Atar deals with “Historicizing the Transhistorical, Apostasy and the Dialectic of Jew Hatred”. Indeed study of a decade of hate mail sent to the Central Council of Jews in Germany and to the Israeli embassy in Berlin concluded that it is “impossible to distinguish between anti-Semitism and anti-Israelism.” He describes how Avraham Burg became the promise of the Israeli left, how he tried and failed to become the leader of the Labor party and how he retired from political life in Israel at the age of forty-nine to become “a modern-day Shabtai Tzwi”. Jean Axelrad Cahan analyzes with “Literary Theory and the Delegitimization of Israel” the book “The Invention of the Jewish people” of Shlomo Sand. Bruno Chaouat dissects with “Good news from France” Enzo Traverso’s ideas about Jews. Mark Weitzman describes “Antisemitism and the Radical Catholic Traditionalist Movement”: The continued presence of a large and vigorous Catholic movement that embraces antisemitism and rejects the concept of religious liberty for others poses a clear threat to the political and religious rights of Jews and other non-Catholics. The Uniqueness Debate Revisited/Bernard Harrison; Denial, Evasion, and Antihistorical Antisemitism: The continuing Assault on Memory/David Patterson; Generational Changes in the Holocaust Denial Movement in the United States/Aryeh Tuchman. From Occupation to Occupy: Antisemitism and the Contemporary Left in the United States / Sina Arnold; The EU’s Responses to Contemporary Antisemitism: A Shell Game? / R. Amy Elman; Anti-Israeli Boycotts: European and International Human Rights Law Perspectives / Aleksandra Gliszczynska-Grabias; Delegitimizing Israel in Germany and Austria: Past Politics, the Iranian Threat, and Post-national Anti-Zionism / Stephan Grigat; Antisemitism and Antiurbanism, Past and Present: Empirical and Theoretical Approaches / Bodo Kahmann; Tehran’s Efforts to Mobilize Antisemitism: The Global Impact / Matthias Küntzel. The majority of European Jews feel vulnerable, and today Jewish students are concerned about the situation at universities in Canada and the USA. We see a paradoxical situation Jews can feel in most parts of the world safe. At the same time, multi-ethnic societies are in a deep crisis and we do not know who will prevail, rationality or irrationality. This important and exemplary book could help to see the dangers of the “lethal obsession” Antisemitism. Alvin H. Rosenfeld (Hg. ), Deciphering the New Antisemitism, Indiana University Press, 2016, Euro 34,05, Order? Most arguments against Zionism formulated in the pre-state period would find few supporters today. The destruction of European Jewry during World War II and the establishment of Israel a few years later changed history in decisive ways and brought most Jews and others to recognize the need for and validity of a sovereign Jewish state. Nevertheless, in some circles publicly voiced calls for the end of Israel are becoming more prevalent. These antizionist views are emerging at a time when antisemitism is on the upsurge in Europe and elsewhere. How, if at all, are these phenomena related? What are the possible links between antizionism and antisemitism? What does “Zionism” signify to its present-day opponents? When does criticism of Israel cease to be a part of legitimate or acceptable discourse and become a form of antisemitism? Please register at iueurope@iu.edu or +49 30 698078849.